Dream (DRM-T), one of Canada’s largest residential land developers and homebuilders, likes to promote its slogan of building better communities. The real estate company has certainly put those words into action as it works to grow its footprint in Saskatchewan, particularly its major centres Regina and Saskatoon. “We have significant holdings in both Saskatoon and Regina,” Michael Cooper, president and chief responsible officer of Dream, told RENX. “We’ve been active developing in Saskatoon since 1994 and Regina since 1997. However, in the latter half of 2014 prices for oil and other natural resources collapsed, leading to an resource-driven recession in the Prairie province where the economy contracted by 2.8 per cent in 2015. During the summer, Regina City Council approved the concept plan for the first neighbourhood area in Coopertown, which will allow Dream to begin development of an 1,100-acre parcel of land in 2019. “The concept plan is the most important approval in the planning process as it defines the organizing elements within a neighbourhood, including road and open space networks and land uses,” said the company when it released its second-quarter financial results in August. “The neighbourhood was designed to include a nine-acre mixed-use commercial/residential site, a centrally located 10-acre multi-purpose park space, single- and multi-family housing, a connected roadway and pathway system, and multi-modal transportation opportunities. 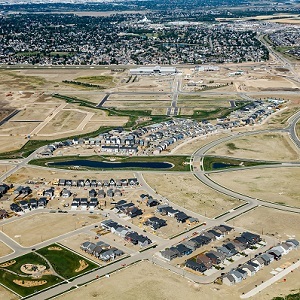 “This first neighbourhood, comprising 160 acres, is expected to accommodate a projected 1,500 residential units and 3,500 residents at build-out. The concept plan is the first neighbourhood within the larger 1,920-acre Coopertown Master Plan area, which was approved by City Council in 2017. Dream also recently achieved initial tenant occupancy in Phase 1 of its first commercial development project, the Harbour Landing Commercial Campus in Regina. The development includes approximately 41,100 square feet of small-bay flex commercial and industrial space across three buildings. It also achieved first tenant occupancy at Brighton Marketplace, a 231,000-square-foot retail development in Saskatoon. Dream owns 50 per cent of the development. Other tenants confirmed for the site include Save-on-Foods, Motion Fitness and The Keg. The first tenant, Landmark Cinemas, opened its doors to customers on June 1, occupying 33,000 square feet. As of Aug. 10, Brighton Marketplace was about 71 per cent leased with a weighted average lease term of 15.3 years. Dream said it expects the development to be fully leased upon stabilization in 2020. So what do Dream’s prospects in the province look like going forward? “We have land for many years there, like 30 years there, 40 years there,” said Cooper. “We’re committed but I’ll be blunt. We always look to Saskatchewan as having more diversity than Alberta and felt that if there was a problem with oil, we thought Saskatchewan would do better than Alberta. It would have less volatility. In the long term, though, Cooper is optimistic. In Saskatoon, Dream’s seven residential communities total 4,500 acres. The largest is Holmwood at 3,000 acres which will eventually house 75,000 in 32,000 housing units. There will also be 5.5 million square feet of future office, industrial and retail developments. In Regina, Dream’s five communities total 3,700 acres with the largest being Coopertown in the northwest part of the city. “Coopertown is a very well-located site. It’s great land. We’ve had the opportunity to put together a significant holding and that’s where there’s going to be a lot of growth in the city going forward,” said Cooper.